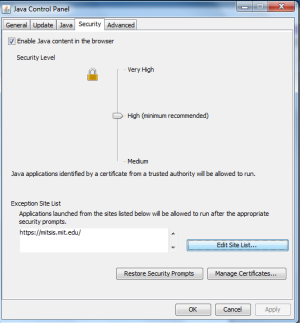 I need to add a secure site to allow Java apps to be run in my web browser. I use Windows 7 and the latest Java build, Java 7 update 17 build 1.7.0_17-b02. However, in the Security tab of the Java Control Panel (found in Windows' Control Panel), the Edit Site List button that should be there is missing. Despite reinstalling, it's simply not there. Two more options on the security level slider are added: Low and Customize. Customize opens a window with no site list configuration possibilities. What to do? Turns out my Java defaulted to the 64 bit version of the software. This software seems corrupted as it lacks the site list configuration feature. Uninstalling this software made Java use the 32 bit version instead, which has the required feature and works as desired. Not the answer you're looking for? Browse other questions tagged security browser java or ask your own question. Where I can find the Java Control Panel in Ubuntu?